I couldn’t find any precise specifications for the amount of gain on offer here, but my educated guess would be at at least 12 dB. Apart from the different options afforded by the FB-2’s tone and Character controls, the booster’s ”sound” and the way it interacts with your rig is naturally dependent upon your amp settings and amp type. A clean channel on a high-headroom amp will give you a clean boost, while a low-headroom amp will tend to break up into natural distortion. Using an overdriven amp different levels of boost and/or compression will result from using this pedal. It is possible to give your signal a kick in the behind without changing your basic tone, or you can use the tone and Character controls to achieve a completely different lead tone to contrast your rhythm sound. The tone knob works between the extremes of warm/fat and bright/sharp, while Character can take you seamlessly from a linear boost all the way to a dramatic mid-range hump. 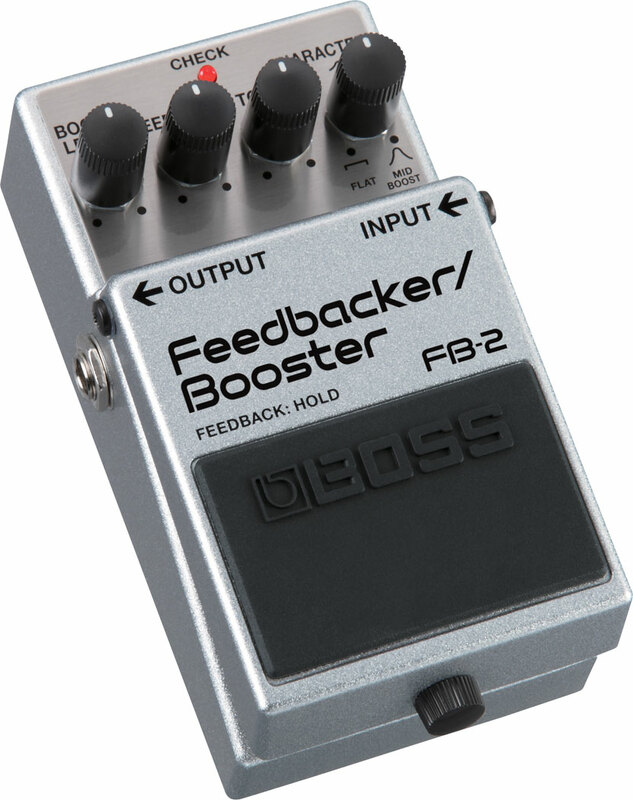 The FB-2’s tone-shaping abilities are as powerful as the pedal is easy to use. Boss’ feedback function gives you credible feedback with the least amount of fuss at living-room volume. In principle the feedback function is the exact opposite of how a vocal processor’s automatic feedback defeat works: the pedal analyses your signal constantly and then boosts the frequency which seems most likely to feed back. Because we deal with genuine feedback – and not an effect based on sampling – the pedal’s feedbacker needs a guitar amp to function. I also tried the FB-2 using studio monitors, but the results were not entirely satisfactory, and the feedback rather hard to control – in all likeliness due to a studio monitor’s wide and linear frequency range. This pedal is a guitar effect and should be used in tandem with an amp. Using the pedal with a clean amp reminded me slightly of E-Bow-sounds, but I feel the FB-2 works best in an overdriven context, because the sounds take on a more fluid singing timbre and the effect is more easily controlled. As usual you can influence, and change, which of the overtones is fed back by changing your position relative to the amp’s speaker. 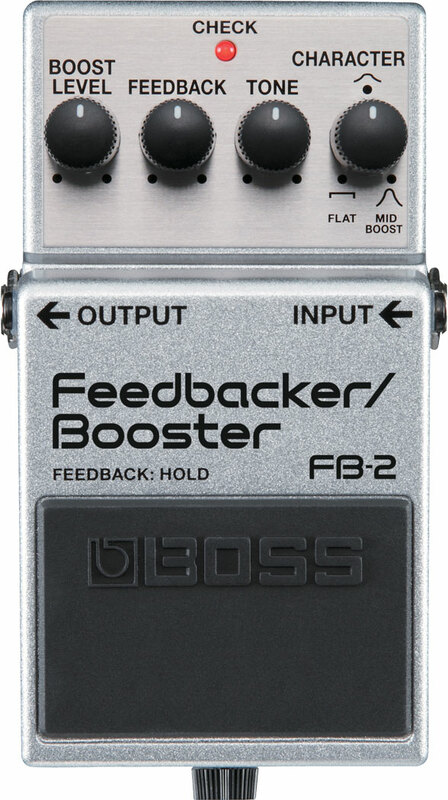 The Boss FB-2 is an amazing, fun and useful piece of gear that offers you both a flexible booster, as well as easy-to-control feedback.